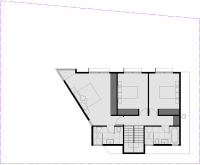 This house was designed for a very small 350 sqm battle-axe site. There were numerous issues determining how the site could be used - the main issue was a sewer easement running diagonally through the site that could not be built over. 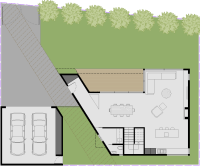 This necessitated some odd geometries in the floor plan, but the resultant design achieves a very liveable house with all rooms facing a private north facing garden.